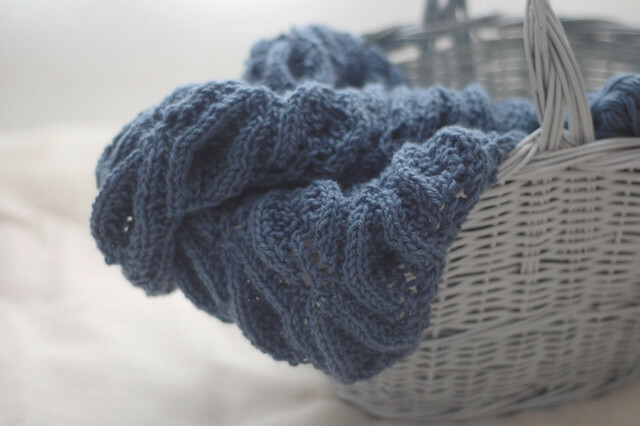 9th January, 2013 // Photographs // tags: blue, shawl. 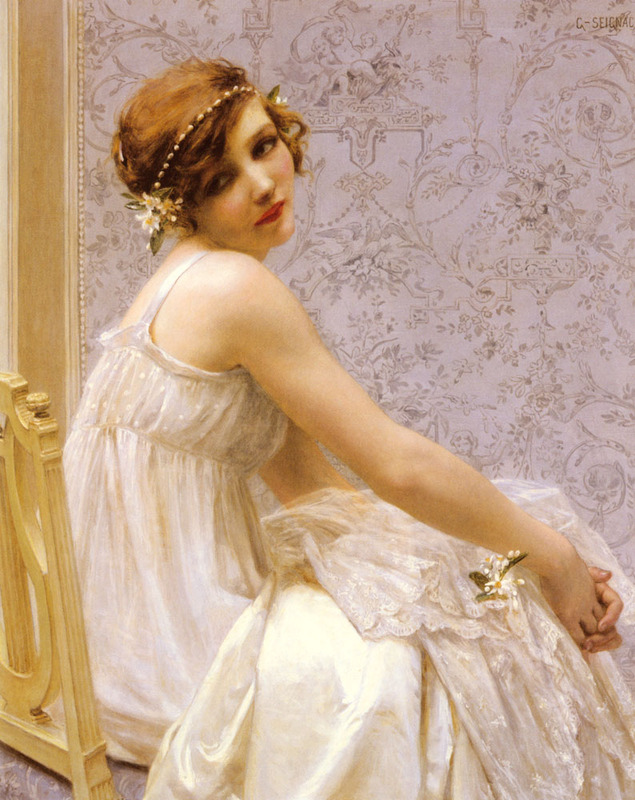 Etymology: < lilac n. + -eous suffix. Definition: Of or belonging to a lilac colour. I’m so utterly delighted & honoured to have a pattern in the latest issue of Knitty! 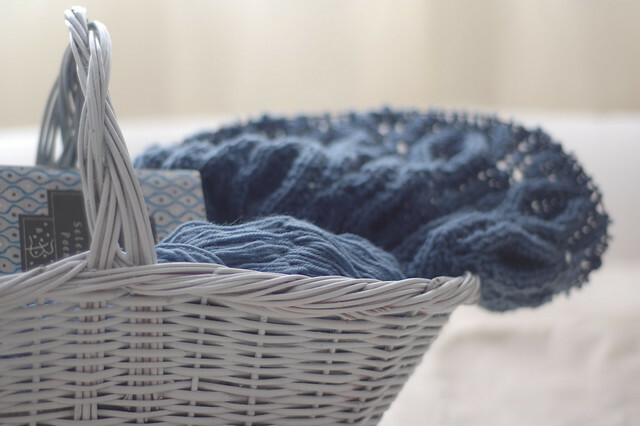 Lilaceous is a lacy counterpane shawl, constructed just like the Beeton Shawl, with three triangles knit around a circular-knit square – and yes, the counterpane shawl ebook I’ve been talking about for ages will be available oh so soon! 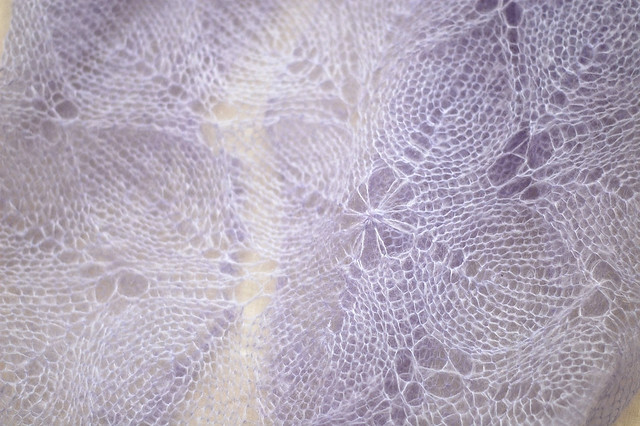 Since lilacs are my thing, I wanted to design a shawl that came as close to capturing their form as I could. I don’t know whether I was thinking about Seignac’s Virginité (or just spying on the neighbours) when I posed for the photos, but the colours certainly remind me of it. Unfortunately it was still far too cold to shoot outdoors, and when the lilacs did bloom, my photography attempts were foiled by dappled light (the bane of correct exposure). I’ve come a long way since my first tentative Clapotis, but lest I’m tempted to rest on my lilacs laurels, Knitty still serves up patterns that mystify me by their elegance and complexity. Thank you Amy, Jillian, and Liz! I also wanted to thank everyone for the overwhelming number of lovely messages I’ve received about Lilaceous; I will do my best to get back to all of you. I ♥ you, knitters! * I’m about to knit another one for a friend who lost hers. ** Possibly my favourite pattern ever (as I’ve mentioned before). I wear one almost every day, and almost every day I get complimented on it or someone asks me how it’s made. 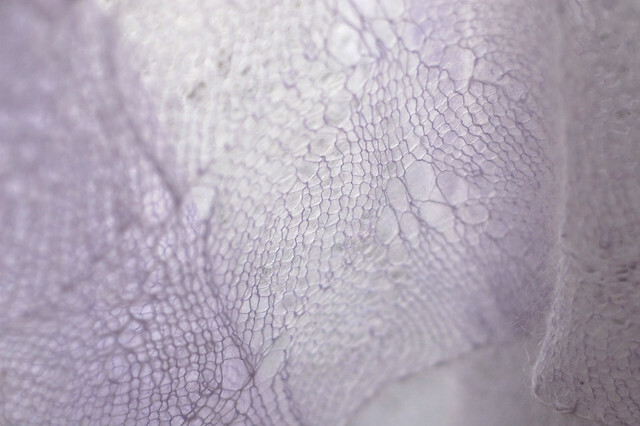 14th December, 2012 // Downloads, Neckwear // tags: free, lace, lilacs, pattern, purple, shawl. The only thing more mindless to knit than plain top-down shawls are plain centre-out shawls. Following on the popularity of my first Shawl Shaping Cheat Sheet (to date it’s been downloaded by over 12,000 knitters), here is a second cheat sheet, this time for medallion-style shawls knit in the round. 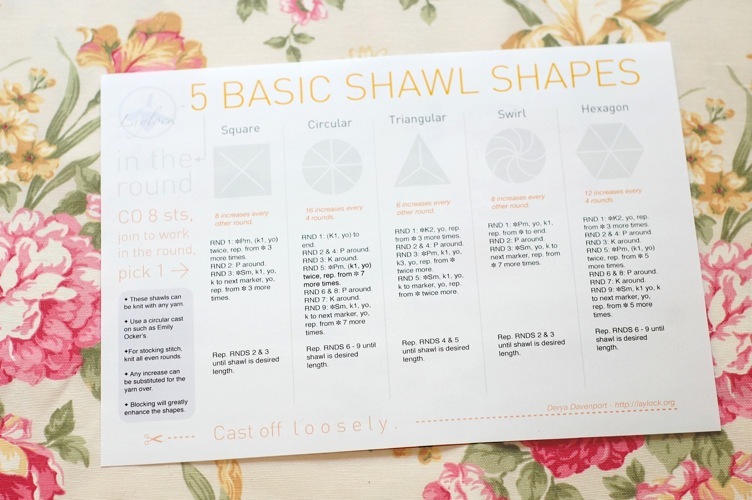 The hardest part of creating this cheat sheet was deciding which shapes to include. In the end I went for the swirl (or spiral) because it’s ever-popular, even though it stands out a bit from the others because it uses single increase units instead of double, and the hexagon because, although it might not be an obvious shape for a shawl, it has several advantages: 1) it tiles (tesselates) nicely, so it can be used in a modular fashion, 2) it can be blocked reasonably round, and 3) it can be folded in half for a very wearable shawl shape. or, you know, decide your shawl is large enough. I received this comment on my 5 Basic Shawl Shapes Cheatsheet just today and it made me chuckle in delight, not just because it’s an amazing compliment to my work (thank you, dear PurlOnions!) but also because I’ve been a bit obsessed with Egyptology recently! And speaking of languages, I want to thank lovely Jennifer (Nylwenn on Ravelry) not just for translating the Cheat Sheet and the Bow Pouch patterns beautifully into French, but also for putting up with my slow communication. Merci beaucoup! 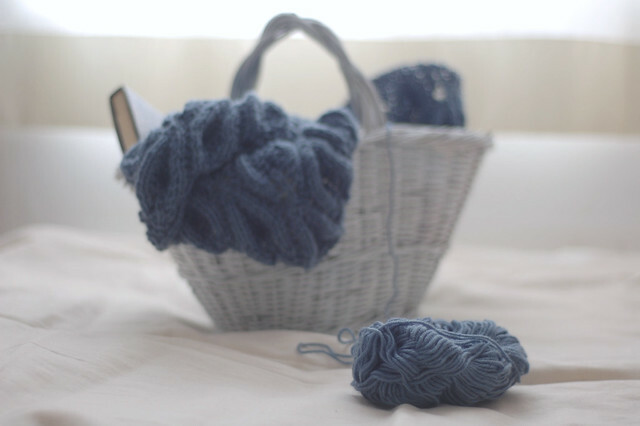 You can use the circular or swirl instructions to knit top-down hats! Knit until the circumference of your “shawl” is the same as the circumference of your head (where the hat brim will sit), then continue knitting around without increasing until the brim is long enough for you. 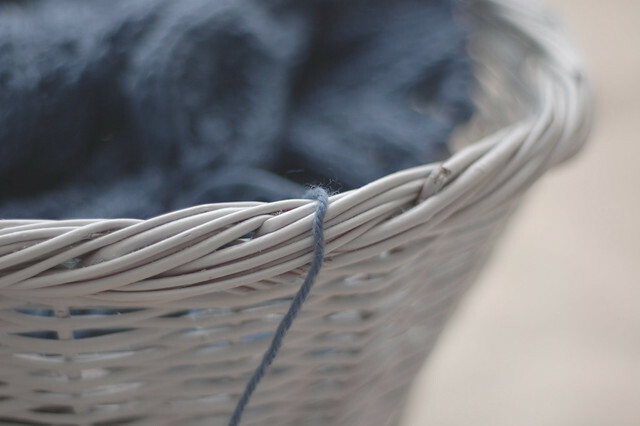 Bind off and you’re done! 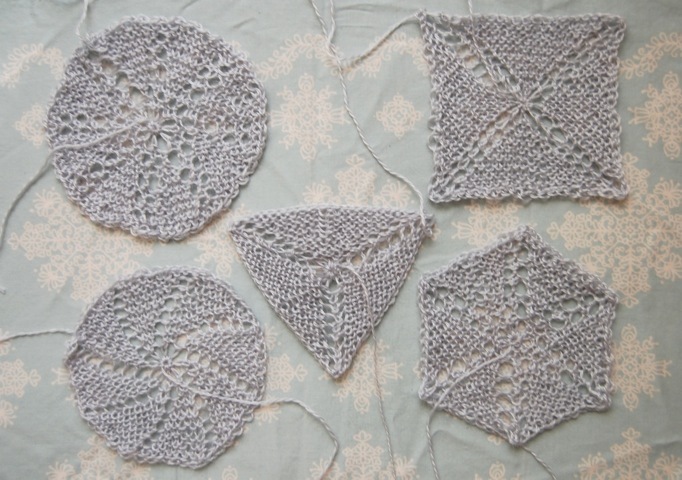 Knit each shape until it’s large enough to use as a coaster. You’ll learn about shaping, and have a set of useful accessories at the end. Solid increases will work better for this, and DK or aran-weight yarn. 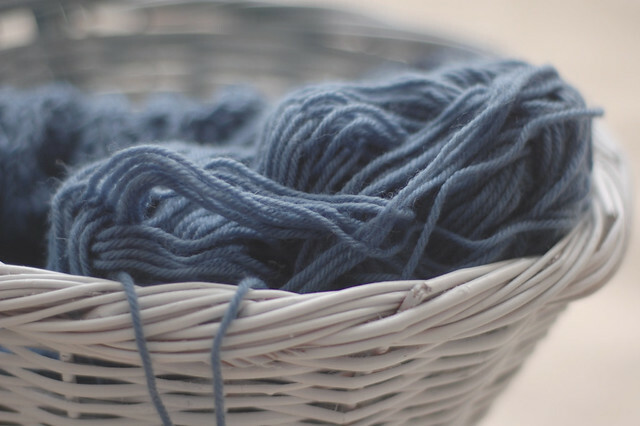 Swap yarn colours every few rounds for an easy-peasy way to create a very attractive shawl. Colour-blocking is still in, no? As always when knitting garter stitch, I recommend you use needles 1-2 sizes larger than your yarn calls for. The abbreviations “pm” & “sm” sometimes cause confusion; these stand for “place marker” and “slip marker” respectively. You may want to use a different-coloured marker for the “pm” so that you can distinguish the beginning of the round. Check back soon for the second volume, for shawls knit in the round! Please DO NOT redistribute this PDF file. You are welcome to use this PDF for educational purposes. 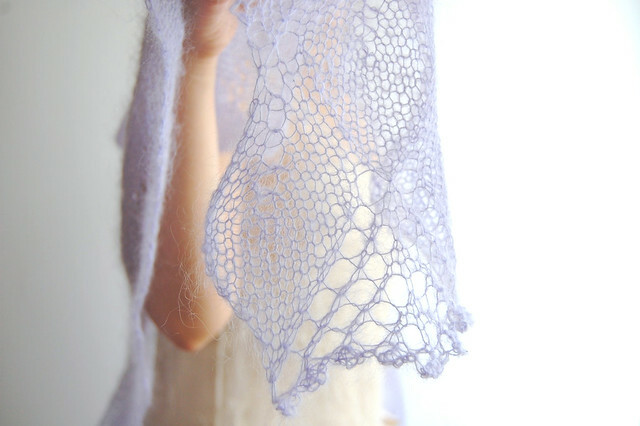 25th September, 2012 // Downloads // tags: cheat sheet, circular knitting, free, mindless knitting, shawl. * Paypal will show you the precise currency conversion before you confirm the sale.